In the second month of 1856, the censors approved five prints by Utagawa Hiroshige (1797–1858) with the series title One Hundred Famous Views of Edo (Meisho Edo hyakkei). And so began the story of one of the most famous landscape series in the history of Japanese woodblock printing.While the city of Edo, renamed Tokyo in 1868, had already been chosen as the subject of numerous paintings, printed books and other woodcut series, there had never been a series with so many views as was promised in the title of this one. The promise was more than kept: by the time of the appearance of the final pictures in the tenth month of 1858, a total of 120 individual prints, issued in instalments, did indeed constitute the most comprehensive topographical series among ukiyo-e, “pictures of the floating world”. The term ukiyo goes back to the Buddhist notion of the world’s illusory and transitory nature. In the course of the late 17th century, the term was extended to secular contexts, referring now not only to the pleasures of the theatres, teahouses and brothels, but also to other popular entertainments in the cities of Kyoto, Osaka and Edo. The last part of the word, e, simply means picture. Many ukiyo-e functioned as advertisements for theatrical performances or sumo tournaments, or they fêted the celebrities of entertainment culture. Portraits of actors in their latest roles, along with those of the most popular, trend-setting courtesans, were among the best-selling motifs. These purely urban amusements had been joined since the 1760s by landscapes. The increasingly mobile population were familiar with many of the places depicted at first hand, but even when they were not, they could use the printed “views” to form an impression of the places they had heard about in stories and poems. The lay members of poets’ circles in the field of haikai and kyōka satirical poems—Hiroshige was one—often used privately distributed prints or illustrated books to depict sites or districts known for their seasonal attractions, and they worked together with woodblock print artists to this end. Some luxury editions of poetry from the 1820s concentrated on Edo, and soon afterwards views of this city, with its one million inhabitants and respected culture, became one of the central themes of ukiyo-e prints. Hiroshige was the undisputed master of this art form. The colors, sites and compositional principles he selected in the One Hundred Famous Views of Edo fascinated the local clientele to such an extent that each print had to be reprinted between ten and fifteen thousand times. As the posthumously compiled table of contents (page 51) mentions in its title cartouche (on a red ground), the series is the artist’s most prestigious achievement (issei ichidai). 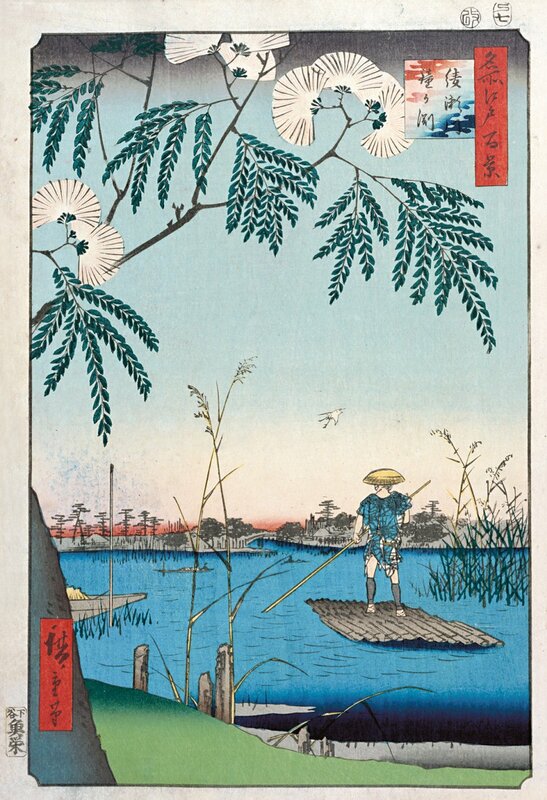 Hiroshige’s predominance in the landscape genre was quickly recognized by European painters and art dealers. The print Bamboo Quay by Kyo-bashi Bridge inspired, among others, the painter James Abbott McNeill Whistler (1834–1903), who was a collector of Japanese objects in general and Hiroshige’s prints in particular. The oil painting Nocturne in Blue and Gold: Old Battersea Bridge, created between 1872 and 1875, bears witness to Whistler’s confrontation with the atmospheric evening mood, the low vantage point and the marked feeling for color combinations that we find in Hiroshige. In 1887, Vincent van Gogh (1853–1890) copied the prints Plum Park in Kameido and Sudden Shower over Shinōhashi Bridge and Atake. Hiroshige, who himself confronted the principles of Western linear perspective in his work, thus became a dual protagonist in the artistic dialogue between Japan and Europe of the late 19th century. 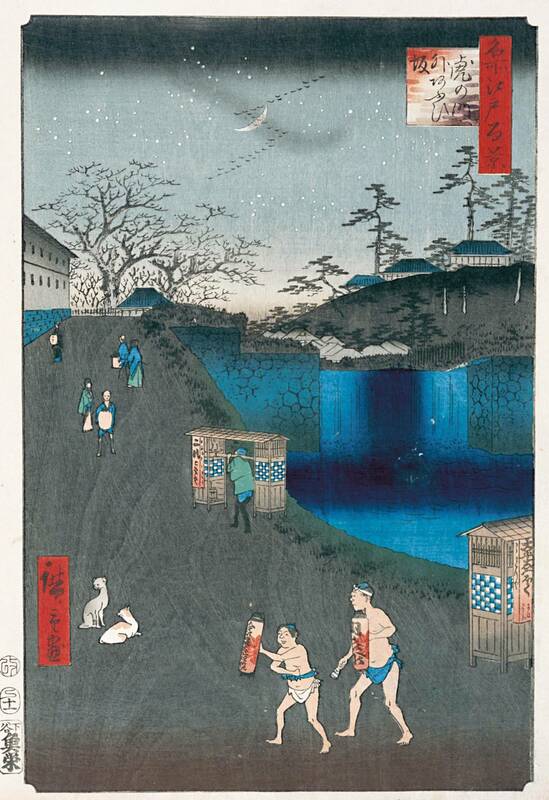 The success of the One Hundred Famous Views of Edo is not due to Hiroshige alone. Thanks to the technical sophistication of the wood cutters and printers, the first impressions achieved an altogether painterly quality, and the publisher Sakanaya Eikichi (life dates unknown) played his key role by commissioning the series in the first place, advancing the materials and fees, and then distributing the prints, all at considerable financial risk to himself. While the One Hundred Famous Views of Edo sold extremely well, this success was not altogether positive. Numerous later impressions (atozuri) found their way to Europe, and, being printed with fewer color woodblocks, did not display the typical elaborate and time-consuming color gradations as did the first impressions (shozuri). They were in fact merely cheap copies of the original masterpieces. Thus the One Hundred Famous Views of Edo as a whole, or individual prints, were occasionally described in the art literature as garish trivialities, heralding the end of the ukiyo-e woodblock print as an art form. 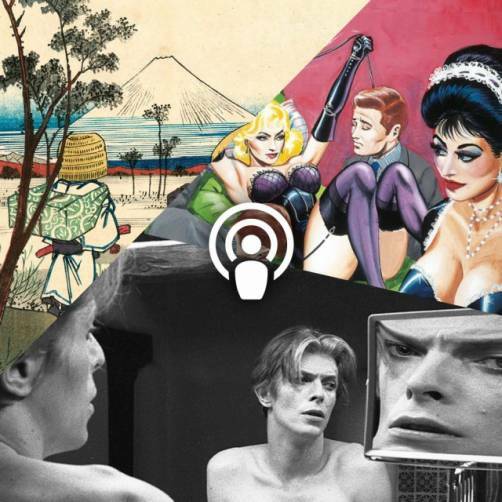 The magnitude of the discrepancy between first and later impressions became apparent to a broader public only when high-quality color reproductions became available in the second half of the 20th century. The series in the Ota Memorial Museum of Art in Tokyo, which is that reproduced in the present volume, is one of the few complete series consisting entirely of impressions from the first print run. The popularity of the One Hundred Famous Views of Edo is due not least to the selection of sites. Temple and shrine precincts are to be found along with busy streets, public parks and pure landscapes, often with a background extending into the far distance and featuring many rivers, canals and bridges. Not quite 40 per cent of the prints show places never previously depicted. Hiroshige and his publishers hoped to use this element of surprise to increase sales. In this sense, Hiroshige invented “new traditions” and with his own series at the same time recalled “pictures of famous places” (meishoe), a tradition that extended back to the 10th century. These pictures, which had circulated among the elite since the Heian period (794–1185), took up poetic allusions to seasonal specialities of the places in question, an aspect which in Hiroshige’s newly chosen views is not very prominent. However, every educated Japanese would immediately have linked “one hundred”, in the context of famous places, with One Hundred Poets, One Poem Each (Hyakunin isshu), a widely disseminated collection dating from the early 13th century and known quite generally in the 19th century through numerous imitations and parodies. As Tsuzumi Tsuneyoshi (1887–1981) remarks in his 1929 book The Art of Japan, it was “an invention of the ukiyo-e painters, in particular Hiroshige, to represent densely populated areas as landscape pictures”. Indeed, almost every print either includes human figures, or else hints at their presence. In these pictures, Hiroshige, unlike his famous older contemporary Katsushika Hokusai (1760–1849), rarely focuses on labour. Instead, he depicts Edo’s different social classes and sometimes also visitors to the city, especially on the occasion of seasonal customsand festivities and when engaging in tourist or leisure activities. Even though a certain melancholy emanates from some scenes, Hiroshige presents an Edo of manifold attractions, unspoilt idylls and prosperity. A compositional, seasonal or color role was often played by vegetation, in particular trees, which sometimes bear names. The blossoming cherry trees we see on 15 prints express more than just a season, however. The reference was to an Edo blossoming once more following the catastrophic earthquake of 1855. Less frequently, certain areas are symbolized by animals, while birds are often used to enliven broad areas of sky and lend depth to them. Almost all the prints are characterized by clear weather, a red horizon hinting at sunrise or sunset. Only three rainy scenes and seven snowscapes interrupt the run of good weather. This picture-postcard atmosphere can be understood as a commercial strategy. Strict edicts forbade the depiction of Edo Castle or any of the other buildings or installations of the shogun. It is true that places occupied by the military regime were sometimes concealed from the censors by being given an innocuous title, or else the castle appears in the background, or its outer ramparts and moats are integrated into the composition. Yet there remains a huge void in the center of Edo: 2.4 square kilometers (less than one square mile) are largely hidden from the eyes of the viewer. The choice of the ōban format, i.e. a vertical format, in the present series measuring 36.5–37.7 cm (approx. 14.3–14.8 in.) by 24.9–26.4 cm (approx. 9.8–10.4 in.) for the One Hundred Famous Views of Edo was novel for landscape prints. By using the vertical format, Hiroshige was also harking back to the tradition of vertical hanging scrolls often employed for landscape paintings. With their fine color gradations and other special printing techniques, these woodblock prints resemble painted pictures. 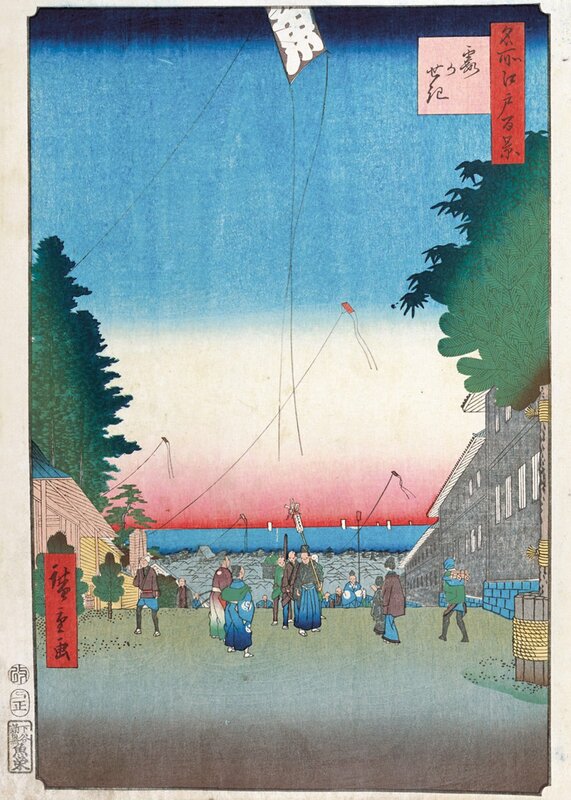 The use of the vigorous and contrasting colors blue, red and green, and sometimes also yellow, but often also subtly composed related hues, such as the blue-toblack shadings in Fireworks by Ryōgoku Bridge was by the mid-19th century part of the repertoire of ukiyo-e printmakers. At the same time, they reveal Hiroshige’s familiarity with the established painting schools of his age. 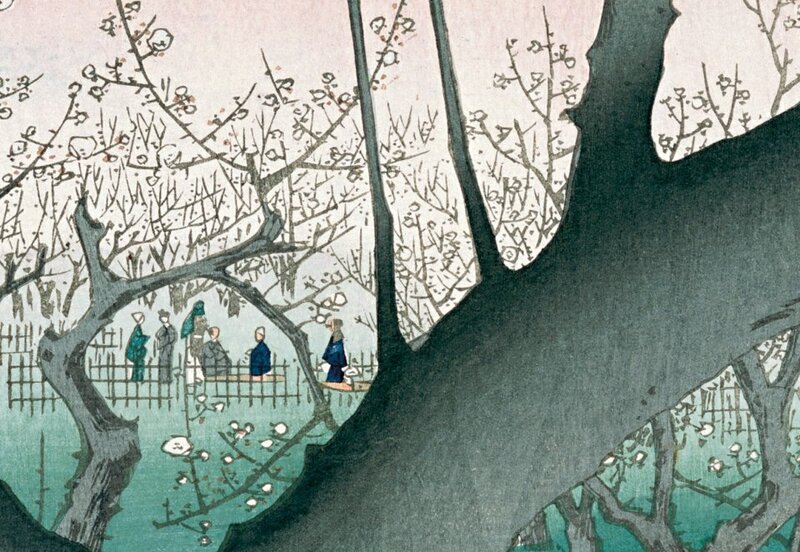 The eclecticism of Japanese painting at this time is also reflected in the principles of picture composition we see in the One Hundred Famous Views of Edo. Three important techniques of pictorial composition go back to different sources. 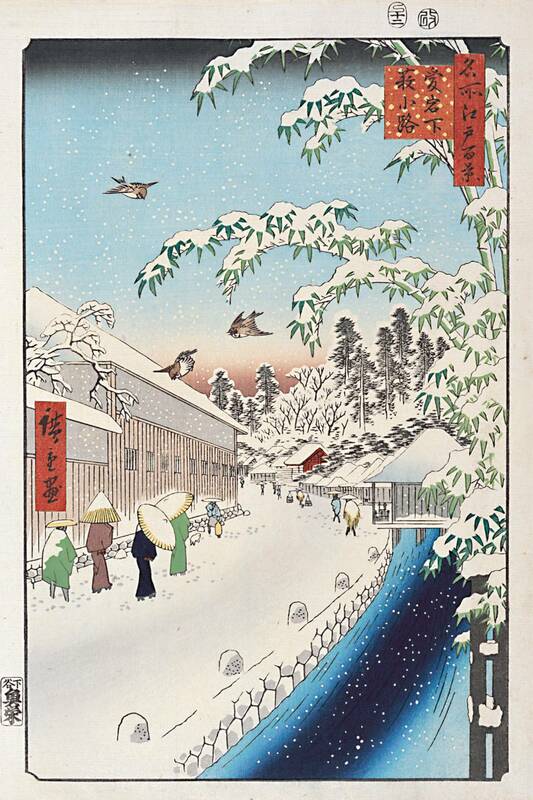 In numerous prints, Hiroshige chooses the bird’seye view anchored in the Japanese painting tradition. But while our gaze falls on to a landscape from above, at the same time the overlayering of pictorial planes generates space and depth. Typical in the use of this technique are, for example, the prints Moto-Hachiman Shrine in Sunamura and Senju Great Bridge. There is no fixed point to define a picture’s center; we are encouraged instead to let our gaze wander. Another technique is Western linear perspective. Its optical realism had made it a widespread feature in the popular medium of the woodblock print since the mid-18th century, and Hiroshige used it for prominent street scenes, among other things. One or two house fronts run from the sides of the picture at an acute angle towards an often undepicted vanishing point. Sometimes he combines this relatively schematic grid with the bird’s-eye view. 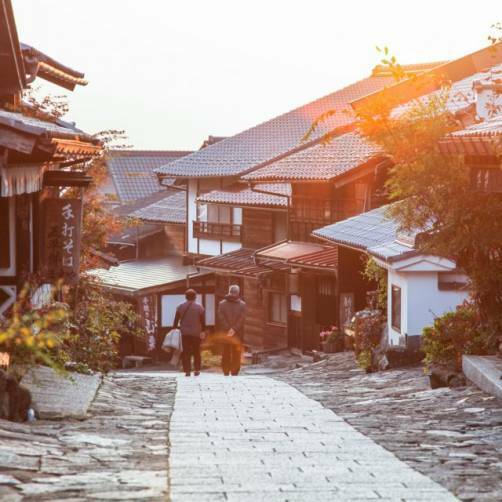 In the view of Suruga-chō, for example, we look down on the street in which people are going about their business; those in the middle distance are reduced to schematic figures of men and women. In the distance, precisely above the imaginary vanishing point, Mount Fuji rises majestically from a broad band of cloud. The third compositional principle to contribute to the fame of this series is that of a motif seen close up and usually cropped by the margin of the print; through the motif, or to one side, the actual scene is situated in the middle distance and background. The stimulus for this technique, which was certainly unusual and occasionally comes across as contrived, originates also in Western vanishing- point perspective. But Hiroshige emphasizes the contrast between the large object in the foreground, known as a repoussoir, and a background pushed further into the distance than would have been conceivable in mid-19th-century European art. The extreme cropping of the motifs was also unusual amongst Hiroshige’s Japanese predecessors; this is true, for example, of the “pictures in the Dutch style” (ranga) painted since the end of the 18th century. The apparent randomness of the cropping suggests that a certain moment in the course of an action is being captured. In the Plum Orchard in Kamada, for example, the empty palanquin encourages us to imagine the coming and going of the visitors. Suggestive details such as these were intended to provide contemporary buyers of the prints with something to discuss. The well-known Hiroshige scholar Suzuki Jūzō described this technique as photographic, while the most influential connoisseur of the One Hundred Famous Views of Edo in the West, Henry D. Smith, referred to them as proto-filmic, since they included the element of time. When the founder of the Tokugawa dynasty, Ieyasu (1542–1616), occupied Edo in 1590, the city was still a country town surrounded by marshy land. After becoming shogun in 1603, he had the local castle comprehensively rebuilt, and soon the city began to develop into a political center, and increasingly a place of commercial importance. Its cultural achievements began to unfold only after the catastrophic Meireki fire of 1657, which claimed more than 100,000 lives and razed both the city and the castle to the ground in a matter of hours. Reconstruction, however, proceeded rapidly and in a well-organized fashion. Edo at this time covered 44 square kilometers (17 square miles), making it more than twice the size of Japan’s second-biggest city, Kyoto. By 1725, it had become half as big again, while its population, at more than a million, was the largest of any city in the world. By the mid-19th century, when the One Hundred Famous Views of Edo appeared, it had an area of almost 80 square kilometers (30 square miles) and an estimated population of up to two million. More than half of these people were craftsmen and merchants, but they inhabited only 21 per cent of the total area. These two estates were regarded as the lowest ranking in the Confucian four-estate system (shinōkōshō) introduced by the Tokugawa dynasty, the top rank of the social hierarchy comprising the warrior caste and the second the farmers. The system did not extend to either the imperial court aristocracy or to the hinin and eta, who were classified as “non-human”. What does the historic Kisokaido Trail look like today?